TOA Universal Speaker is a small, 2-way bass-reflex type speaker featuring a wide frequency range suitable for use for announcements and music playback. can be used for both high-impedance and low-impedance applications. The speaker's splash-proof construction permits it to be installed under the eaves where the speaker is not directly exposed to rain. 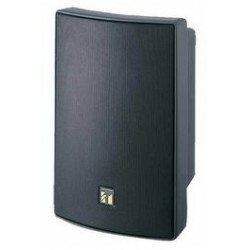 TOA ZS-1030BThe ZS-1030B is a small, 2-way bass-reflex type speaker featuring a wide frequency range..
TOA ZS-1030WThe ZS-1030W is a small, 2-way bass-reflex type speaker featuring a wide frequency range..
TOA ZS-062Rated Input Selection/Impedance : 6W, 3W, 1.5W, 0.8W (100V Line)Frequency Response :&..
TOA ZS-102CColumn Speaker 10 WRated Input Selection/Impedance : 10W, 5W (100V line)Frequency Respons..
TOA ZS-202CColumn Speaker 20WRated Input Selection/Impedance : 20W, 10W (100V line)Frequency Respons..
TOA ZS-203CB/CWColumn Speaker 20WType : Sealed TypeRated Input Selection: 20WImpedance : 100V line :..
TOA ZS-403CB/CWColumn Speaker 40WType : Sealed TypeRated Input Selection: 40WImpedance : 100V line :..
TOA ZS-603CB/CBColumn Speaker 60WType : Sealed TypeRated Input Selection: 60WImpedance : 100V line :..